The shear forces and corresponding strains appearing in the flow under the action of chemical potential gradient have been analyzed. The ratios for determination of the viscosity coefficient for low-molecular pure liquids and solution components were established. 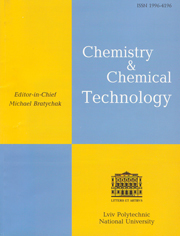 It was proved that the viscosity of the low-molecular solution can be expressed via the terms of the viscosity coefficients of its components and via their concentration. Frenkel J.: Z. Phys., 1926, 35, 652. Frenkel J.: Kineticheskaya Teoriya Gydkosti. Nauka, Leningrad 1975. Eyring H.: J. Chem. Phys., 1936, 4, 283. Ewel R. and Eyiring H.: J. Chem. Phys., 1937, 5, 726. Glasstone S., Laidler K. and Eyring H.: The Theory of Rate Processes. Princeton University, New York 1991. Kendall J. and Monroe L.: J. Amer. Chem. Soc., 1917, 39, 1789. Lonsdale H., Marten U. and Rilly R.: J. Appl. Polymer. Sci., 1965, 9, 1341.
. Medvedevskikh Yu, Turovski A. and Zaikov G.: Khymycheskaya Phizika, 1998, 17, 141.
. Medvedevskikh Yu., Kytsya A., Bazylyak L. et al. : Stationary and Non-Stationary Kinetics of the Photoinitiated Polymerization. VSP, Leiden, Boston 2004.